By now you should have an idea on how to enter a pot which has been opened with a small raise or a limp. Sometimes though – especially in late stages of SNGs – it happens that a player acting before puts all or virtually all his chips in the middle. In such cases, you can either fold, call the all-in, or – provided you have more chips – reraise in order to isolate the all-in player. It is important to understand what the most important factors when approaching a spot like this are. In this lesson, you will see how to make your decision in these situations by learning the three steps you should follow when facing an all-in. The process of making a decision in a situation like the one described above involves several steps. First of these steps is to calculate the equity that you need to call an all-in. You always need to start with a chip equity based calculation. To do that, you need to divide the amount that you need to invest in the call by the size of the pot including your call – which is the same as the current pot size plus your investment. In this example, the blinds are 100/200 with 25 ante. The middle position player has moved all-in for 2,000. You are in the button and are contemplating upon a call. You need to invest 2,000 in the call, and the pot you would be standing to win is 2,525 + 2,000 = 4,525. Therefore, the equity you need to profitably (in terms of cEV, disregarding the possibility of an over call) call the all-in is 2,000 / 4,525 = 44.2%. If the hand you are holding has any more equity against the pusher's range, then in the long run, assuming the blinds always fold, you are guaranteed to win chips on the call. The last statement in the previous paragraph highlights the two problems with a straightforward chip equity calculation. It does not take into account the possibility that a third player might decide to enter the pot as well. Neither does it account for the implications of ICM, which – unlike in many situations for the pushing ranges – tend to influence the decision significantly. To allow for the effect of diminishing monetary value of chips, you need to simply add the estimated risk premium to the calculated chip equity needed. Of course, in game you might not be able to calculate it. It is therefore necessary to get a feel (which comes with experience) for what the risk premium might be in a certain spot and/or memorize the average risk premium in different stages of a SNG. To continue with the earlier example, it is assumed that the hand in question comes from a 9-man SNG with a standard 50/30/20 payout structure. In this case, the risk premium for this example equals approximately 5.5%. That means that the equity needed to call profitably increases to 44.2% + 5.5% = 49.7%. But that is not the end. You need to adjust for the possibility that one (or more) of the players behind you calls as well (in the example it would be either SB or BB). This is not an exact science, and depends on a number of factors, like the number of people behind, their stacks, risk premium, player tendencies. Generally you need to call “a little tighter” than you otherwise would if you were closing the action. To allow for that in your calculation, it is advisable to add an arbitrary adjustment of 0.5% per each player left to act to the previously calculated equity threshold. In most cases, an adjustment of a similar size will be sufficiently prudent. In this lesson's example, that leads to the final result of 49.7% + 1.0% = 50.7% equity needed to call an all-in. If there are players left to act, as a default add 0.5% per each remaining player to the calculated equity threshold to adjust for the possibility of an over call. One of the last things that you need to do is to assign the pusher a range that he is likely to go all-in with. It is usually best to start with assigning him a range that he “should” have. It may be done by taking the range according to the pushing charts, or simply by taking the range that you would play in his position, and then adjust if necessary if the player in question is significantly tighter or looser than the average player when it comes to pushing. 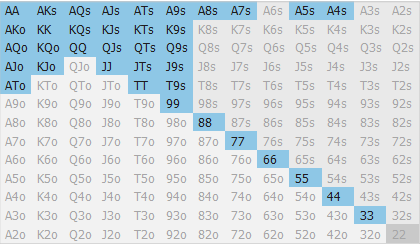 In the example from above, villain may be expected to be going all-in with the following range: 33+, A7s+, A5s-A4s, K9s+, Q9s+, J9s+, T9s, ATo+, KJo+ (16.6% of all hands). The very last step is to compare the equity of the hand you hold against the range of hands that you assigned to the villain, with the calculated equity threshold warranting a profitable call. If your equity is better than the threshold, you should call/reraise. Otherwise, you should fold. In the recurring example, the following hands: 88+, AJs+, AQo+ (5.9% of all hands) have more than 50.7% equity against the estimated pushing range. You should call if you hold one of these hands, otherwise you should fold. If a call already commits you to the pot, it makes no difference whether you call the previous all-in or just go all-in yourself. However, it may happen that in a given spot calling an all-in does not commit you to the pot at all, or only commits you against certain (shorter stacked) opponents. This can be the case if the effective stack between you and the players behind you is significantly larger than the all-in stack. In such cases, the best solution is to flat call with the hands that you can call profitably against the all-in player, but would rather fold to further action from a deep stacked player. To balance these hands, you need to flat call with the top of your range as well. This way, a skilled opponent cannot exploit your game plan, as your call will not give away the strength of your hand. In general, you should end up flat calling with all of your continuation range and deciding whether to call or fold after you get raised. You can make an exception for situations when your opponent is most likely to call your potential isolation tighter than he would go all-in if you just flat called. Such spots may happen quite often under high risk premium circumstances, like on the bubble. In those spots, you might be better off just isolating with hands which are good enough to play for stacks with a deep stacked player behind, but can benefit from discouraging action from likely coin flips more than from encouraging an opponent to enter the pot. You need to calculate the equity needed taking into account pot odds, risk premium, and over call possibility. You need to assign the villain a range and check the equity of your hand against that range. Flat calling an all-in is better than reraising if it helps to avoid commitment. Take the quiz and test your understanding of this lesson. Discuss this lesson or ask your questions in the forum. doesnt programs like HSC and icmizer do this for you so we dont need to work out calculations in the middle of a game.? sorry i meant HRC oops..
good to know that the general rule shold be call the all in not raise even if it does not pot commit you.